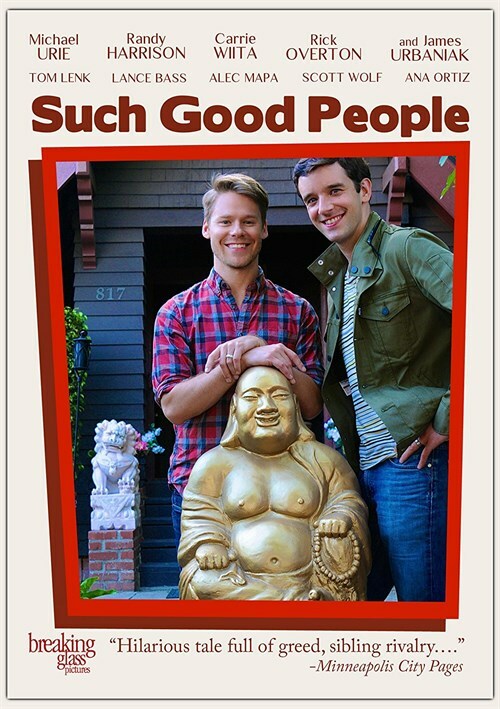 Such Good People is a contemporary screwball comedy about a young gay couple, Richard (Michael Urie) and Alex (Randy Harrison), who discover a secret room filled with cash while house-sitting for their wealthy humanitarian friends - who have unfortunately just died in a car accident while doing missionary work for the children Bhutan! Though saddened, Richard and Alex want what everyone wants: success, money, and, of course, a fabulous house in Los Angeles! After the boys discover wads of cash that the deceased couple will now, obviously, no longer need, mayhem ensues as they deal with jealousy, sibling rivalry, greyhounds, labradoodles, porpoises, and other friends who want the money as well. Guaranteed to ship today if ordered within the next 8 hours and 31 minutes. Why was this film made.? The storyline is over the top.There are several gay characters who give such 'queenie' performances (especially the guy near the finale) that I wanted to throw up. They are so very embarrassing to watch.The acting is also atrocious and the two leads may be good looking but it is a pity that their acting is so bland. It does nothing at all for promoting gay cinema. It is such an embarrassment. A gay couple, Richard (Michael Urie) and Alex (Randy Harrison), met straight couple when they crashed a garden party. The two men learned that Jake and Chloe Jake (Scott Wolf) and Chloe (Kate Reinders) are both humanitarians who love to travel abroad and work with charities that adopt orphaned children. A friendship developed quickly and they were soon house-sitting for them while they go to Bhutan to do some charity work. Richard and Alex discovered a hidden room on the house with a million dollars of cash in it as well as some valuable artifacts from the Far East. Not long afterwards the guys receive word that Jake and Chloe were killed in a car accident. Of curse this was something of a downer for them but it really had no effect on how they felt about the money that they found. Then along came Alex's sister Paige (Carrie Wiita) and her husband Cooper (James Urbaniak), who just happened to be close friends with Jake and Chloe and who know what they left in the house. They searched all over the house for the money but found nothing. Paige (smart girl) surmised that Alex and Richard must have the money. From this point on the film is about Paige finding ways to try to get the money back. This is where the film becomes weak as nothing she does is convincing. What I was hoping to see was a comedy that would keep me laughing but unfortunately most of what was supposed to be funny falls flat. What made it so hard for him to really like this film is seeing that the intent for comedy is there but it was not executed in a way to make this a truly good film. Aside from that the two gay leads held a lot of promise for me and I was looking forward to see Randy Harrison again after having not seen him in a film since "Queer as Folk". Director Stewart Wade had a great idea for the film but somewhere he lost it. Comedy is difficult to write and difficult to perform and it seems we are well past the idea of slapstick.